U.S. military members will not owe federal income taxes - or in most cases, state income taxes - on their paychecks when assigned to a designated combat zone or area supporting military action in a combat zone. Members of the U.S. Armed Forces carry many burdens on the job. But thanks to a slew of special benefits and breaks, their tax burden will weigh a little less heavily. Tax-free combat pay: Like anyone else with a paycheck, enlisted military personnel's pay is subject to income tax. But if you're assigned to a designated combat zone or to a unit that directly supports military action in a combat zone, your pay during that assignment is excluded from federal income taxes. Combat pay for officers is also tax free, but only up to the amount that the highest-paid enlisted soldier makes -- which is roughly $5,460 a month, said Rochester, N.Y.-based CPA David Young, a combat veteran and retired Lieutenant Colonel from the U.S. Army Reserve. Combat pay is also free of state taxes in every state but New Jersey, said Julie Sforza-Smith, a principal tax research analyst at H&R Block's Tax Institute. Greater flexibility in claiming the Earned Income Tax Credit: Normally you have to have earned taxable income to qualify for the Earned Income Tax Credit, which is intended to help lower income households, especially those with children. But military members may choose to count their nontaxable combat pay if it qualifies them for a larger EITC, even though their combat pay remains tax-free. This provision especially helps military families in which one spouse receives combat pay and the other stays home to take care of the kids. Without it, they would not qualify for the EITC, Young said. State breaks on military pay: Active-duty military members and reservists are expected to file state tax returns in the states where they lived when they enlisted or, if they're a reservist, when called up for duty, said Sandra Martin, an enrolled agent based in Rochester, NY. Of course, military members who hail from the nine states that don't impose an income tax -- including Florida, Texas and New Hampshire -- won't have to file a state return. But everyone else should check carefully how their home states handle military pay because close to half of the states that have an income tax provide tax breaks on military income, Smith said. Moving expenses deduction: If you are reassigned to a new base, you may deduct any moving-related expenses for which the military doesn't reimburse you. You're eligible to take the deduction no matter how near or far your new station is from your old one. 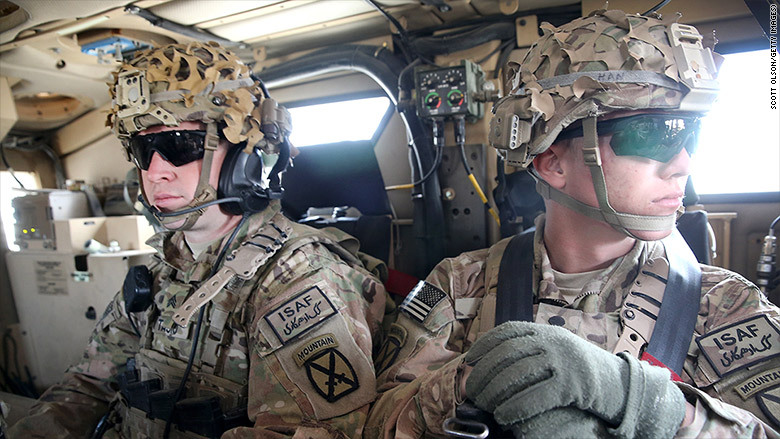 Reservists' travel deduction: Rules for deducting travel expenses are more permissive for members of the U.S. Army Reserve than for civilians. Reservists may deduct any unreimbursed travel expenses when called up for duty to an area more than 100 miles from home. Those expenses may include mileage, tolls, airfare and lodging. What's more, reservists may take this "above-the-line" travel deduction even if they don't itemize their deductions, Young said. Penalty-free 401(k) withdrawals: Reservists called up for active duty for more than 179 days may end up taking a pay cut from their normal jobs. If that puts your family in a tough spot, you're allowed to take money from your 401(k) or IRAs without having to pay a 10% early-withdrawal penalty, Young said. But you will still owe income taxes on that money. You can file -- and sometimes even pay -- your taxes later: If you're based outside of the United States or Puerto Rico, you are granted an automatic two-month extension to file your federal tax return, without having to apply for the extension. But you will still have to pay what you owe by April 15, Martin noted. If you need more time, you then would have to apply for an additional four-month extension. If, however, you're serving in a combat zone, the rules are much more liberal. You will not have to file your federal tax return or pay what you owe until 180 days after either your last day serving in the combat zone or the last day of your continuous hospitalization due to an injury received on duty, Smith said. Tax debt forgiveness: This is a benefit no one wants to receive. But federal tax debt may be forgiven for members of the U.S. Armed Forces who die on active duty in a combat zone or from a terrorist or military action. The tax debt eligible for forgiveness is that owed in the year of death as well as that which was owed in the prior tax years in which either the injury occurred, or the first day in which combat service began.